Armourgeddon - Armourgeddon Blog - Blog - Tank Activities at Armourgeddon and more! Tank Activities at Armourgeddon and more! We are often asked what activities we run here at Armourgeddon, so this month we thought we would do a run through to whet your appetite! We are often asked what tank activities and tank driving experiences we run here at Armourgeddon. So this month we thought we would do a run through to whet your appetite! Our adult and child experiences start with a thrill ride in one of our FV432 tanks around the ex-bombing range at Armourgeddon, driven by one of our expert instructors. Once the instructor pulls up at the range, it’s over to you to learn to load, aim and fire the 40mm paintball canon at the static targets. Next up, it’s your turn to drive, as the adult of your pair takes the controls, manoeuvring the tank around the track for two laps. Your first lap will be with the hatch open and then, for the second lap, we will lower your seat, close the hatch and you will drive in battle conditions, viewing the track through the periscope only. This experience can be taken as a two or three vehicle activity. 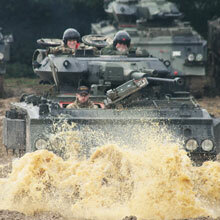 Our tank driving experience is run on a one-to-one basis. First of all, your instructor will drive you around one of the tracks here at Armourgeddon, based on the old WWII bombing range. Then it’s your turn. Your first lap is driven with the driver’s hatch open so that you can become accustomed to the track and the controls. Then it’s out of your comfort zone for the second lap, in battle conditions, looking only through your periscope, it’s back to the track for lap two. The third lap is your choice; will you drive with the hatch open or closed? When you arrive at Armourgeddon, you will meet the rest of your crew, be given protective clothing and helmet and be introduced to your instructor. You and your crew will take it in turns to drive one of our fleet of FV432 tanks around the ex-bombing range here at Armourgeddon. Firstly, you will drive with the hatch open, until you have mastered the controls it’s hatch down, into battle conditions and only the periscope to view the track through. Once you’ve had your turn, you become a passenger to enjoy someone else’s driving skills! Come and visit us on our archery range for a spot of target practice! After tuition from your instructor on stance and technique it’s up to you to pip the ace. Using the latest and greatest in bolt-action, pre-charged air rifles, take to the bunker and test your skill against your opponent! Keep a steady aim as you look down the sniper scope on your rifle, making every shot count. After some tuition on the safe use of your shot gun and a quick look down the sights at a few practice clays (or birds as the professionals call them…), it’s time to start scoring. With the birds getting faster and coming from different directions, it gets harder to hit the target as you get better. As part of a 3-man team, arranged by Armourgeddon, unless you happen to be 3 people visiting together, and with some guidance from your instructor, you will be transformed into an elite tank crew greasing the gears of paintball warfare! After a briefing on the vehicle, you and your crew will take it in turns to drive around our World War II bombing range. First with the hatch open to gain your bearings, then in battle conditions. When the nerves have settled, it’s time for target practice! Master the art of aiming the 40mm canon fitted in the turret of the tank and then test your speed and accuracy in the loader and firing positions. After discussing some battle tactics, it’s time to get the adrenalin pumping and make your crew proud, taking on the enemy in a Tank Paintball Battle. Who will drive? Who will load? Who will aim and fire? Far and away our most popular activity, Armourgeddon is the only location worldwide to run tank paintball battles. Bringing people with you? You can pay an extra £20 per person to have them join you in your activity, taking a seat in the back of the tank and enjoying the action from there. Please ask in advance about passengers as the number you are able to book in varies dependent upon the activity you are taking part in. When booking for individuals, we operate our activities from April to October. If you are booking for groups, we can take bookings for dates outside of these months. We have gift vouchers available for purchase as gifts and have lots of experience in planning stag and hen party activities. What more could you want?! Looking to book an activity? Call us on 01858 880239 or visit our gift vouchers pages for our activities. Comments on Tank Activities at Armourgeddon and more!